It's no secret that high blood pressure increases your risk of heart disease and stroke. Nor should it come as a surprise that binge drinking isn't the healthiest habit. But a new study suggests that combining the two may add up to double the trouble—and much more, in some cases. THURSDAY, August 19 (Health.com) — It's no secret that high blood pressure increases your risk of heart disease and stroke. Nor should it come as a surprise that binge drinking isn't the healthiest habit. But a new study suggests that combining the two may add up to double the trouble—and much more, in some cases. Compared to teetotalers with normal blood pressure, men with high blood pressure (hypertension) who even occasionally down more than six drinks in one sitting have nearly double the risk of dying from a stroke or heart attack, according to the study, which followed 6,100 South Koreans age 55 and up for two decades. If men with high blood pressure have 12 drinks or more at one time, their risk is nearly five times higher, the study found. "Somehow the binge drinking compounds [high blood pressure]—and more than just a little bit," says Brian Silver, MD, a neurologist at Henry Ford Hospital, in Detroit, and a spokesman for the American Heart Association (AHA). But the researchers, who are based at Yonsei University, in Seoul, can't say for sure that binge drinking directly caused strokes and heart attacks in the hypertensive men. The study was based on surveys and did not take into account the timing of the binge drinking and subsequent cardiovascular events. Still, the findings ring true, says J. Chad Teeters, MD, a cardiologist at the University of Rochester Medical Center, in New York. "There have been studies that [drinking] alcohol can increase blood pressure 15 to 20 points," he says. "And if you start off hypertensive, raising your blood pressure 15 or 20 points probably does as much as double your risk of stroke, so this certainly fits with things we already know." Men with severe high blood pressure are at even greater risk, according to the study. If those men have six drinks in one sitting, their risk of a deadly stroke or heart attack quadruples compared to that of a nondrinker with normal blood pressure. If they consume 12 drinks in a sitting, their risk increases 12-fold. Next page: What's normal blood pressure? Normal blood pressure is defined as 120/80 mmHG or below, while high blood pressure (or hypertension) starts at 140/90. In this study, which appears in the AHA journal Stroke, severe hypertension was considered to be 168/110 or higher. 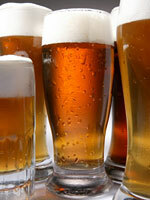 On their own, both binge drinking and hypertension up the risk of fatal stroke or heart attack. Regardless of whether they drank alcohol, the men in the study were twice as likely to die from a cardiovascular problem if they had hypertension—as were the heavy binge drinkers, regardless of their blood pressure. Experts aren't certain why binge drinking might increase cardiovascular risk. Hypertension is known to damage blood vessels, and drinking alcohol may contribute to the hardening of arteries. It may also make the arterial plaques that cause strokes and heart attacks more unstable. "There's something about alcohol that makes the blood vessels more vulnerable to plaque formation and plaque rupture," says Dr. Silver, who was not involved in the new research. The findings may not necessarily apply to everyone. There were too few women binge drinkers in the study for the researchers to determine whether the same patterns held in women, for instance. And the study was conducted in a rural population in South Korea, where the drinks of choice are soju (a rice wine similar to Japanese sake, only stronger) and makkoli (a milder rice-based drink). It's not clear whether Jack Daniels and Budweiser would produce the same results. The study's shortcomings aren't an excuse to drink too much or allow your blood pressure to get out of control, however. The AHA recommends that men and women consume no more than two drinks and one drink per day, respectively. "Binge drinking is probably not a good idea anyway. Uncontrolled hypertension is not a good idea. The combination is worse," says Robert Myerburg, MD, a cardiologist and professor of medicine at the University of Miami Miller School of Medicine. "These are pretty impressive numbers if they're correct," he adds.